Just before I got married a few of my friends told me I had better buy my last gadget before the big day because it would be the last for a long time. That logic might apply to other guys but I may be married to my technology just as much as I am to my Wife. Let's face it, a computer and a good internet connection can be an adequate substitute for a good wife. Guys, you know what I'm talking about ;) Fortunately my Wife has accepted my digital lifestyle and in fact, has embraced embraced that lifestyle as her own. So I'm lucky a guy. My house could be what Steve Job's had envisioned when he coined the term, "Digital Lifestyle." Earlier this week I completed my collection and added a long absent piece of technology to the mix. I got an excellent digital video camera from Panasionic. The PV-GS300 It's a 3 CCD miniDV camera that takes some excellent video. So now, with an iMac G5, a Canon Digital Rebel, a Pentax Optio S4i, a Panasonic PV-GS300, great web hosting from Geeklair.net, and .Mac, my Son's life will be captured in it's entirety in full digital goodness. Most of which will be presented right here. So stay tuned to my version of the 1998 classic, "The Truman Show." Only this time starring, Andrew Joseph Fayne. Andrew's a very good boy. He was born on Monday and we just got home last night. We didn't miss a single Pistons game. The Pistons finished up a short west coast trip and had the last 3 nights off. I guess my boy already knows the Pistons schedule. So, tonight is a big night. It's very fitting that Andrew's first Pistons game is Pistons vs. Bulls. 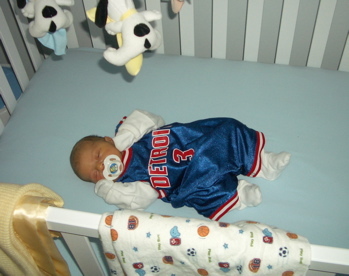 Daddy is a die hard Pistons fan but Andrew was born in Chicago. So tonight Andrew can decide his life long affiliation. I'm laying it all on the line, If the Pistons lose, He'll be a Bulls fan. Fortunately, my little dude will be wearing his first Ben Wallace jersey courtsey of Uncle Keshun, so I'm confident his Piston power will be strong. My Son was born this morning at 3:27am. He was 7lbs 12.9 oz and 20.5 inches. Brooke battled the boy for 19 hours. He put up a good fight but with mother nature on her side Brooke won. Check out Andrew's .Mac website for his Birthday blog post and all of the all of his photos. I 'll post more tomorrow when we get the little guy home. I'm posting this from Panera bread across from the Hospital and there's not much bandwidth here so, I will post more tomorrow from home. It's almost Daddy time. Little Andrew was due last Thursday (March 2nd) so I went to bed every night last week hoping I wouldn't be at work in the morning. Alas, the kid gave us no signs of his arrival so I suffered through five days of misery. Normally the weeks fly by at CDW but last week was torture. I didn't have a lick of focus. I was hoping Tuesday's Apple product announcements would tide me over but they were disappointing so all I could do was count the minutes to Daddy time. It was kind of like knowing you're about to get a new car but you have no idea when it'll arrive. I don't know if that quite captures the feeling, but I'm sure you have all had an experience you can relate to. Obviously my persepctive was quite different from Brooke's. She's been home on maternity leave for the last two weeks so I think she's been bored more than anything else. I admit I've been a bit jealous because I could sure use the time off too but she's more than earned the break. It's been a long nine months and the changes Brooke has gone through have been amazing. She's been so brave and so cool through the whole pregnancy. She's so ready to be a mom that I think any fear she has is smothered with pride. Even now, on the eve of the big birthday, she's cooler than I am. Andrew has a very special Mommy. I just can't believe I'm about to be a Dad. I've known it was inevitable for the last 9 months and I've dreamt about it for a lot longer than that but I feel like it was only a few short years ago that I was cuddling my yellow blanket and tearing up the plastic in my diapers. So, a new era for me begins tomorrow. We went to the Hospital this morning and Brooke is now in pre-labor. Her Dr. thinks AJ will be born sometime tomorrow so keep checking Andrew's blog for Photos and stats, we'll be posting all the details as we get them and wish us luck. This Photocast will appear in your iPhoto Source list and you can use its photos just like any other photos in your library; for slideshows, your desktop, custom photo books, etc. And, whenever you are connected to the Internet, iPhoto will automatically update this Photocast so you see the latest photos I've added. If you don't have iPhoto 6, you can view the photos in this Photocast with Safari RSS or any compatible RSS reader on Mac, Windows or other computers by using the link above. Just click on the link or copy it into the URL field of your RSS reader and bookmark the URL to return to the photos in the future. This page is a archive of entries in the Family category from March 2006. Family: December 2005 is the previous archive.